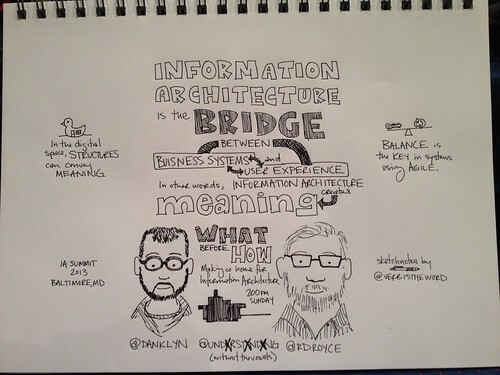 Summary: Bob Royce and Dan Klyn share the slides from their 2013 IA Summit talk on "Making a Home for Information Architecture." So far the conversations that have come out of it are great and we look forward to discussing these issues with more of our colleagues in the future. Are you struggling to carve out a place for information architecture in the world of acronym soup? In this talk, longtime IA Dan Klyn and his business partner Bob Royce explore the pros and cons of bucking the trend of “all encompassing UX” to focus our practice on IA. How the lens of IA helps us solve problems beyond UX and collaborate readily with other non-UX disciplines. Our experience delivering services both directly to clients and through agencies. How we explain IA to people outside our industry and work to justify a larger investment in IA. How we go beyond information retrieval and navigation to include the concepts of meaning and place-making in our work. Since all of the above was accomplished through much trial and error, there will also be plenty of discussion about the failures we’ve encountered along the way.